I get it. California can be an overwhelmingly large state and it’s hard to know where to start in terms of travel planning. In my humble opinion, the best way to see the state is by driving through it. The classic Highway 1 road trip itinerary is one option for those who have less time or who just really want to see pretty coastal scenery (completely understandable). Though to get a better understanding of California and its sheer natural diversity, it’s essential to venture away from the coast. Here’s a 10 day California road trip itinerary that will take you from the mountains to the desert, and ending up in a coastal destination so you can see the beach after all. First, let’s discuss some logistics to make sure you make the most of your trip through the Golden State. September to early October is an ideal time to go. During this time, California is experiencing late summer weather in San Francisco and Los Angeles, and the national parks are less crowded. Summer weather can be cold, especially since San Francisco tends to be extra foggy during the summer months, and Los Angeles experiences June Gloom, where days can be chilly and overcast. California has a Mediterranean climate, which gives the state dry summers and rainy winters. Right before the rainy season starts in mid to late October, it’s important to take advantage of the ideal seasonal weather around the state. May is also a good time to plan a California trip, but depending on the severity of the rainy season, roads to national parks like Yosemite can still be closed. Trust me, late summer to early autumn is going to be your best bet. I recommend starting in San Francisco, just because it’s a smaller, more manageable city than Los Angeles. You will not have to deal with the headache of Los Angeles traffic (though San Francisco does have its fair share of backups). You can also ditch your car and use public transportation to easily zip around the city. It will be a nice break before spending the next week and a half on the road. Ending your road trip in Los Angeles is nice because this city has plenty of pretty beaches and an easy-going Southern California way of life that you can embrace before heading back home. This is the ideal city to get your bearings in, spoil yourself at all the good San Francisco restaurants, and visit the diverse neighborhoods, where each seems like entering a different world. Get in plenty of steps in this walkable city, where you can quickly log in your daily 10,000 steps or more before you know it. What to see: Take a ferry across the bay to Sausalito, wander around Golden Gate Park, explore historical neighborhoods like Chinatown and North Beach. Where to eat: Treat yourself to a dim sum brunch at Hong Kong Lounge in the Richmond neighborhood, get your fill of carbs at Tartine in the Mission, and eat your way through the Ferry Building restaurants. Where to stay: For a mid-range option the Holiday Inn Express and Suites Fisherman’s Wharf or the Marriott Courtyard San Francisco Union Square are solid options. Travel tip: take BART back to airport to pick up your rental car right before you hit the road. Having a car in San Francisco for the few days you’re visiting is usually a bigger headache than it’s worth with parking. Local public transportation and ride-sharing services will get you everywhere you need to go. The beautiful city of San Francisco should definitely be on your 10-day California road trip itinerary. Driving time from San Francisco to Lake Tahoe is around 3.5 hours. If time permits, stop in Sacramento for lunch! The North Shore is quieter, more spread out, and nature-oriented. The South Shore has a more touristy vibe with a lively nightlife with the bars, casinos and resorts of Stateline and South Tahoe. The distance between the two locations is around an hour, so it’s important to choose which area best suits your needs. What to see: Plan a day hike around either Emerald Bay or neighborhing D.L. Bliss State Park in the southwestern corner of the lake. If you prefer a less active activity, float down the Truckee River, which flows out of the northwestern corner of the lake. Where to eat: Artemis Lakefront Café is a great place to grab Mediterranean food with a lake view on the South Shore. There are two Artemis cafes, so make sure to choose the one at Ski Run Marina for a memorable view. Fire Sign Café is a reliable choice on the North Shore in Tahoe City for brunch. Where to stay: For the South Shore the boutique hotel Basecamp South is a lively spot to call home for a few days. On the North Shore the Best Western Plus Truckee has a reasonable price and includes breakfast. There are also vacation rentals in popular areas like Incline Village and Kings Beach as well in North Tahoe. Travel tip: double check park closures, since some close in September, but it depends on the weather. Driving time from Lake Tahoe to Yosemite is around 2.5 hours to the entrance of the park. 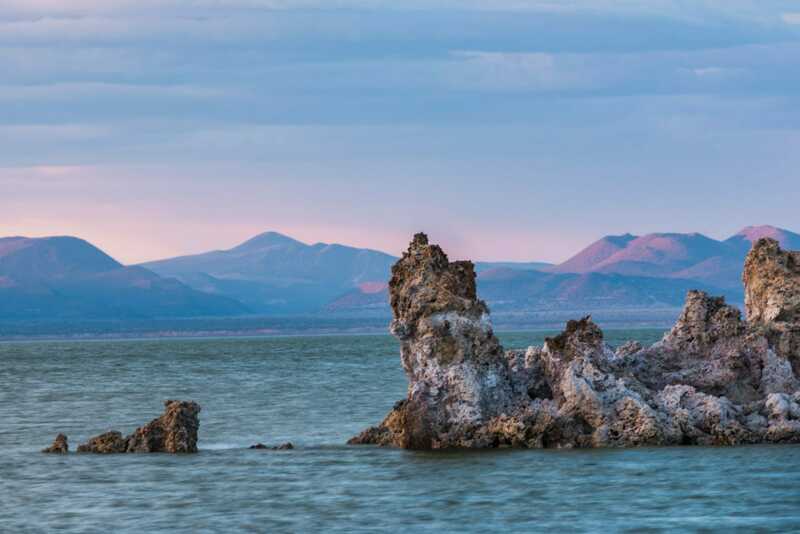 If time permits, stop at Mono Lake, a saline body of water, which is known for its columns of limestone growing out of the water. It’s hard to plan a California road trip and miss this iconic national park. The trick to having a successful trip is meticulous planning and more planning. No joke there is no such thing as having an overly detailed itinerary when it comes to Yosemite. The best time to visit is May or September when there are less crowds and the weather isn’t too hot. The difference between these two times is that during May the waterfalls will be in full flow as the snow melts, but in September there isn’t as much water after a dry summer, but the scenery is still stunning. What to see: Whatever you do, make sure to plan plenty of time to explore. From the walking paths of Tuolumme Meadows (open from late May or early June to November, depending on the season) and the easy, flat hike of the Cook’s Meadow Loop, to the more strenuous Vernal Fall and Nevada Fall Trails, there’s activity levels for everyone. Where to eat: The food in the valley itself is not particularly noteworthy, but there’s the historic Ahwahnee (Majestic Yosemite Hotel) for a pricey meal that’s more about the atmosphere, where reservations are recommended. For a more casual meal there’s Degnan’s Kitchen for reliable sandwiches and pizza. Where to stay: If you have limited time in Yosemite, it’s highly recommended you stay inside the valley, since it takes about an hour or more to get from the entrance to the valley if you stay outside. For luxury digs the Majestic Yosemite Hotel in the valley is a popular choice. If you prefer more rustic accommodations, the Half Dome Village is worth checking out for their heated tent cabins. Travel tip: There are multiple park entrances depending on where you’re coming from. If you are driving from Tahoe, you will most likely enter from Highway 120 through the town of Lee Vining. Make sure to always double check road closures the day before, since things can change quickly. Driving time from Yosemite to Death Valley is around 4 hours. If there’s ever an example of California’s contrasting landscapes, the drive from the high altitude Sierra Nevada mountain range to the bone dry desert landscape of Death Valley is it. It’s best to avoid going during the summer when the temperatures can easily reach 110 degrees and over. What to see: Stop by the Furnace Creek area which includes the park’s visitor center, restaurants, and gas stations. Visit Zabriskie Point, one of the most popular lookout points in the park, where you can hike from the Badlands Loop or just drive up and soak in the view. Experience the Badwater Basin, the lowest elevation in North America at 282 feet below sea level, where you can view the mysterious salt flat from the parking lot. The Racetrack with the magical moving rocks is also worth a mention (though it’s highly recommended to not go with a regular rental car due to the rough road). Where to eat: Timbisha Village Frybread Tacos and Shave Ice for veggie and meat taco options. For a sit down meal the Panamint Springs Resort Restaurant has solid burgers and fries, as well as massive salads. Where to stay: There are limited accommodations in the park and not all places are open year-round. That being said The Oasis at Death Valley is home to two of the best hotels in the area: The Inn at Death Valley and Ranch at Death Valley. The Inn is more luxury travel, while the Ranch boasts a more casual setting. Travel tip: Do not underestimate the dry dessert heat and be prepared with plenty of water (at least a gallon per person/per day). Make sure to fill up on gas before entering the park, since it’s expensive and limited to areas like Furnace Creek, Stovepipe Wells, and Panamint Springs. Driving time from Death Valley to Los Angeles is around 4.5 hours. There is no better city to wrap up your California road trip at than the city of Los Angeles. Drive to a beachside bar, grab a cold one, and sit back and admire the view. You deserve it. What to see: See the sprawling city from above at Griffith Observatory, spend a day relaxing at the Wii Spa in Koreatown, drive down the coast to Malibu and spend the day beach-hopping. Where to stay: The Gateway Hotel, a mid-range hotel less than two miles from the beach and Santa Monica Pier, with free parking. For luxury digs, the Loews Santa Monica Beach Hotel boasts a view of the Pacific Ocean. Where to eat: Eat a Turkish-inspired breakfast at Kismet, grab a sandwich at Gjusta in Venice or ramen in Japantown at Daikokuya. Travel tip: Plan your LA itinerary around neighborhoods that are close to each other to minimize driving across town. This means meals too. LA is a big city and driving from Santa Monica to Downtown in weekday rush hour traffic is not for the faint of heart. There you have it. A tour of some of the best of what California road trips has to offer. Of course you can mix and match the schedule so it fits your personal time frame. You can extend your stay in places like Yosemite or San Francisco, if you have more time or you can add on activities like hiking in Joshua Tree if you want to experience another of the state’s stunning national parks or stop by Palm Springs if you want to experience this luxurious desert town where many an Angeleno escape to on the weekend. If you want to be extremely ambitious (as in another 6+ hours), you can combine this trip with a drive up Highway 1 after coming to Los Angeles. You can also stay in Los Angeles longer and explore all the different neighborhoods, tan on the beaches and eat your way through the city. It’s completely up to you. What’s on your California road trip itinerary?